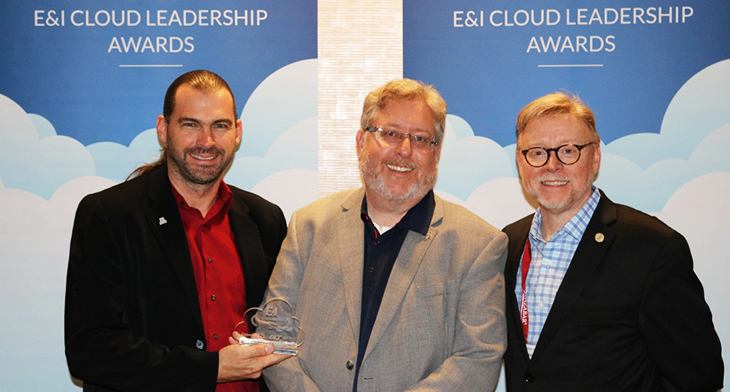 University of Arizona UITS has been recognized for the second year in a row during E&I Cooperative Services’ second annual Cloud Leadership Awards at Educause 2018. This year, UA received Runner-Up in the category of Public/Private Cloud Security for our work on Transit VPC (virtual private cloud) connectivity. It is a Cisco virtual routing platform within AWS that streamlines connectivity between University of Arizona campus, AWS, Microsoft Azure, and IBM SoftLayer for all our constituents who use those services. This has improved performance and scalability of our cloud connectivity. It also enables us to use standard Cisco security features familiar to the UITS network team and campus net managers. E&I Cooperative Services’ Cloud Leadership Awards recognize achievements in higher education cloud implementation. During the inaugural awards last year, the University of Arizona won in the Backup/Disaster Recovery category, plus an overall win in cloud leadership. This year’s Cloud Leadership Award win was recognition for the hard work of the UITS Network Operations team, who have modernized our connectivity as part of UA’s trailblazing efforts in leveraging the cloud.